The holidays are just around the corner, which means that it’s officially time for awards season, even if a number of studios got an early start last month. Although there aren’t as many options as you would expect from November, the release schedule is packed with promising titles, including Christopher Nolan’s latest mind-bender, Oscar hopefuls starring Steve Carrell and Benedict Cumberbatch, and the penultimate installment of the “Hunger Games” series. What: A group of explorers make use of a newly discovered wormhole to travel through space in search of an inhabitable planet for the human race. Why: Christopher Nolan’s latest sci-fi flick has been so shrouded in secrecy that it seems rude to even talk about it, and therefore, I’d actually recommend skipping this entry altogether. But if you’ve already seen the trailer or have been following your favorite movie blogger on Twitter, then you’re probably aware that “Interstellar” has reached “OMG Best Movie Ever” levels of excitement. 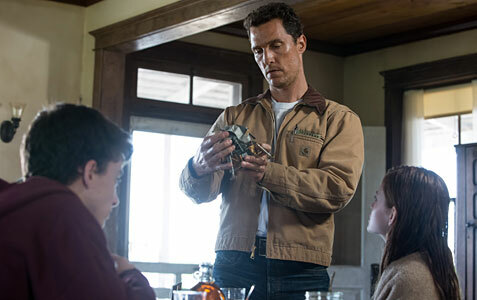 Of course, it’s that kind of ridiculous hyperbole that has made me super cautious about my own expectations for the film, because while Nolan has proven that he’s one of the best directors in the game, and star Matthew McConaughey can seemingly do no wrong at the moment, chances are that although “Interstellar” will be really good – great, even – it won’t be the cinema-defining masterpiece that some are expecting. What: Child prodigy Hiro Hamada and his plus-sized inflatable robot Baymax team up with a group of friends to form a band of high-tech heroes. Why: Pixar may be taking the year off, but Disney wasn’t going to loosen its grasp on the Best Animated Featured category without putting up a fight, although it’s hard to see “Big Hero 6” competing with likes of “The LEGO Movie.” Based on the little-known Marvel comic of the same name, the film certainly looks impressive with its stylish art design, while the cute and cuddly Baymax (whose robotic influences range from WALL*E to C3PO) will likely make Disney millions of dollars based on toy sales alone. Though “Big Hero 6” doesn’t pique my interest nearly as much as the studio’s 2012 hit “Wreck-It Ralph,” here’s hoping that it’s a giant success, if only because it may lead to more animated versions of other forgotten Marvel properties in the future. What: A look at the relationship between the famous physicist Stephen Hawking and his wife. Why: It’s actually pretty surprising that it’s taken this long for someone to make a proper biopic about Stephen Hawking (not counting the 2004 TV movie starring Benedict Cumberbatch, of course), especially considering his prominence not only in the scientific world, but pop culture as well. Director James Marsh’s first narrative feature, “Shadow Dancer,” may not have received the same attention as his documentaries (“Man on Wire” and “Project Nim”), but his follow-up is guaranteed to be in the awards mix thanks to some early buzz following its premiere at the Toronto International Film Festival. The same goes for star Eddie Redmayne, whose performance as Hawking has already garnered praise as the one to beat at this year’s Oscars. And though it’s still early, the trailer does a damn good job of backing up those comments.